(Nanowerk News) The sticky feet of a climbing, gecko-like robot developed by Simon Fraser University (SFU) researchers could be useful in space, international tests show. The SFU research was recently tested in the labs of the European Space Agency (ESA), which has co-sponsored the project since 2008. SFU engineering scientist Carlo Menon says his team developed techniques similar to those used in the microelectronics industry to create “footpad terminators” much like the nanoscopic hairs on a gecko’s feet. A dry adhesive created to complete the process was then tested in space-like conditions. 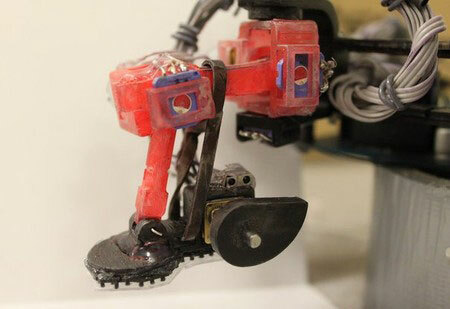 The climbing robot, dubbed Abigaille, features six legs, each with four degrees of freedom for optimum agility, allowing the robot to get around obstacles by crawling vertically or horizontally. The research has involved multiple SFU undergraduate, master’s and PhD students, as well as postdoctoral fellows. Former master’s student Michael Henrey carried out testing of the robots in ESA’s Electrical Materials and Process Lab in the Netherlands. The ESA has issued a news release about the testing and Menon will have a paper published this month in the Journal of Bionic Engineering ("Optimal Gait for Bioinspired Climbing Robots Using Dry Adhesion: A Quasi-Static Investigation"). Since joining SFU in 2007, Menon’s research program has focused on bio-robotics and smart materials. In 2008 he was awarded a grant from the Natural Sciences and Engineering Research Council and a contract from ESA to develop climbing robotic systems. “This research followed two distinct research milestones—the development of dry adhesives and the development of innovative locomotion systems,” Menon explains, noting the robots could potentially be used for everything from cleaning high rises to servicing satellites and even planetary exploration. Menon is also designing an interactive wearable robotic device to improve the quality of life for those who have lost control of their arms and hands due to stroke, injury, aging or disease. The space research was supported by ESA’s Network/Partnering Initiative for universities carrying out research with the potential for space applications.